Happy New Year! I hope you enjoyed the holidays and that 2015 is off to a good start for you and yours. A break from posting gave me the chance to work leisurely on a quilled certificate while listening to Serial. I also got on board with Instagram, something I've been meaning to do for ages, hallelujah! 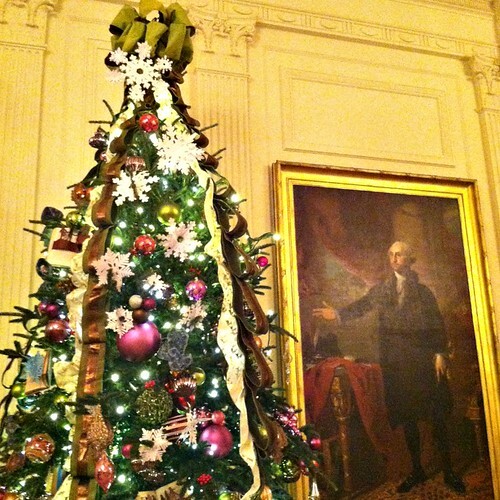 Today I'm excited to take a look at the ways paper was incorporated into the Christmas decorations at the White House. (You might recall last year's post about paper flowers that played a big part in 2013's decor.) I first heard about Jen Lange and the pretty cut paper dioramas and tree ornaments she created via Helen Hiebert's Sunday Paper. Curious to know more about Jen's experience, I was happy when she replied with answers to my questions and photos that she snapped while in the throes of making, as well as some taken when she visited the White House - what a thrill that must have been! 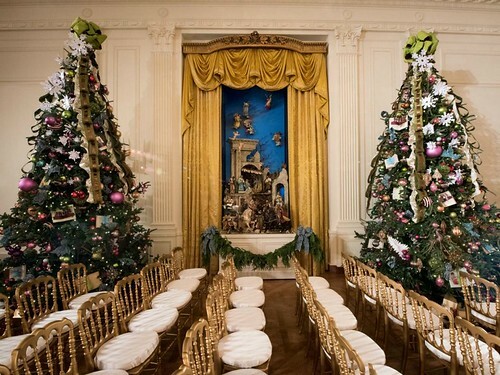 Tell us about the ornaments you made for the East Room's four trees. 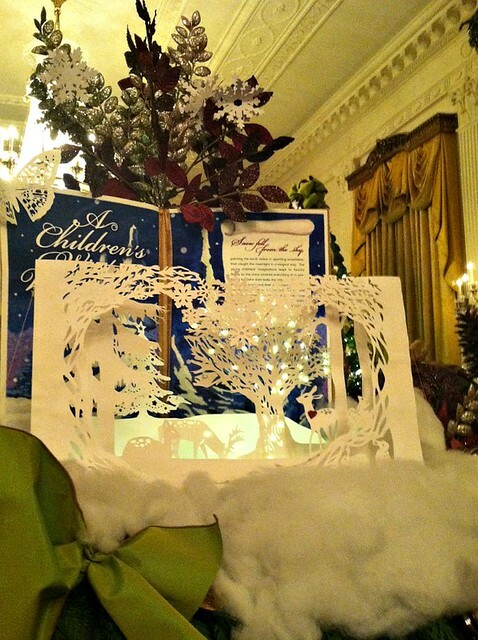 I created more than fifty cut paper ornaments that tied in with the First Lady's holiday theme for 2014, A Children's Winter Wonderland. 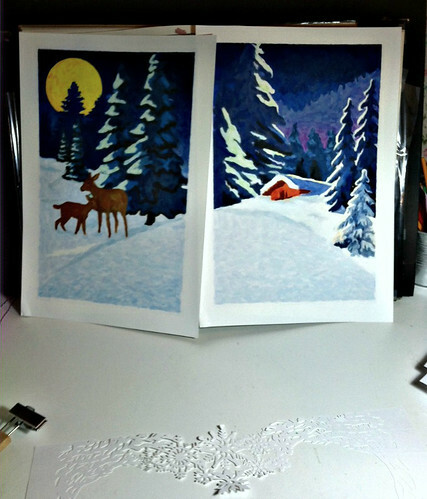 I cut many paper snowflakes by hand and then my mom and I machine stitched them together. 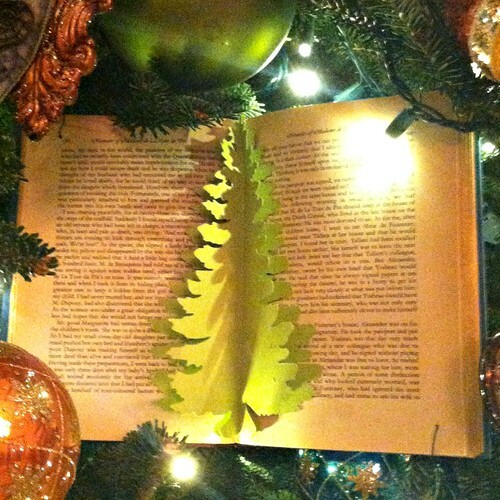 I also designed cut paper children dancing and evergreen trees - several variations of each. These were attached to discarded books donated by two public libraries here in northern New Jersey. 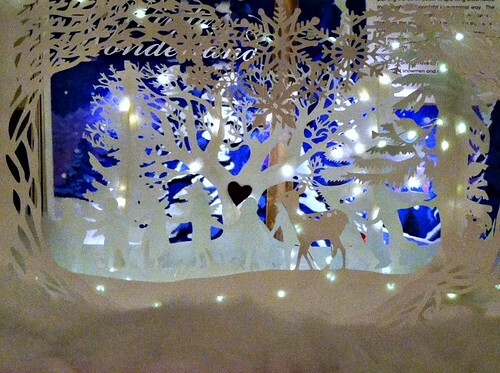 I also made snowflake tree toppers and snowflake tree skirts that were placed around carousel horses. What was involved in the design process? 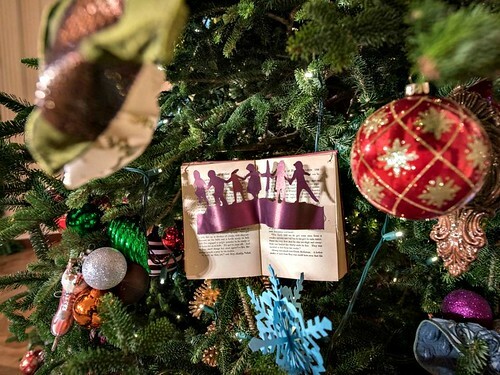 I worked closely with this year's co-decorator, Coleen Christian Burke, to translate into paper Mrs. Obama's vision of books coming to life and snowy scenes. I would sketch my ideas and send images to Coleen who presented them, then I made revisions accordingly. I was chosen in October and FedExed the last of my designs the Tuesday before Thanksgiving. It was much more than a full-time job to get everything done in time. For two months my house looked like a confetti factory! Wow, you were busy, but I bet it was exciting to know your work would soon be on display in such a wonderful way. Tell us about the cut paper dioramas that were placed on fireplace mantels and tables. 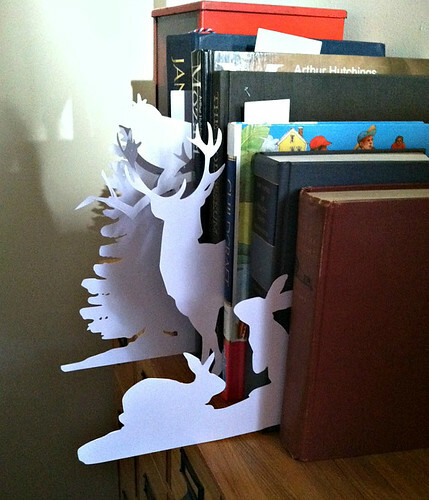 There were a few different designs featuring snowy scenes of cut paper trees and deer. I used 300 gsm (184 lb) white Canson paper to make pop-up dioramas, and I hand painted images that were placed behind each one. The dioramas were reinforced with white floral wire from behind and a lot of white electrical tape. The pieces were secured onto foam core board and mounted on plywood. We worked with the White House electrician to find battery powered lights to bring a festive glow to each diorama. 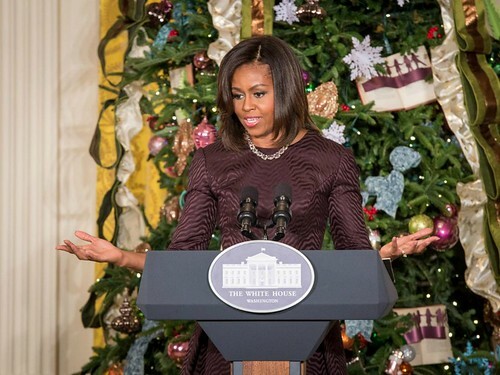 Jen and Coleen were invited along with the entire decorating team to attend the first White House holiday party of the season where they were welcomed by Michelle Obama. Have a look at all of the decorated rooms at HGTV. Follow Jen's latest work via her Cool Dame blog. She is also a graphic designer and is on Facebook. I know what you mean, Traci... paper snow everywhere! wow very nice, love the wintwer seen with the Deer !! Yes, so pretty and the little lights are such a nice effect. I'm glad you liked it, Diana. Happy New Year to you too! So pretty! But what a huge project in a relatively short time frame!